On a cutting board grate carrots and then onion. Blot these vegetables with paper towels until dry. Add them to a large bowl with and add the leeks and scallions. Add egg yolks, flour, salt and pepper to the bowl, mixing gently with a rubber spatula. Grate the potatoes over a cutting board. After each one, place the shredded potatoes into a clean tea towel (or paper towels) and ring well over the sink to remove all their moisture. Add each shredded potato to the bowl. Mix all well. Beat the egg whites until stiff and glossy. Add egg whites into bowl mixing thoroughly but gently. Raise the heat of the skillet to medium-high. Drop 2 tablespoon mounds into skillet, making 12 pancakes, and cook until nicely golden brown. Turn latkes over, reduce heat a little and cook until golden on the second side, and cooked through, about 5 minutes. Remove the latkes to a rimmed baking pan, lined with paper towels. Repeat the process with remaining latke batter, add a little more oil if needed. 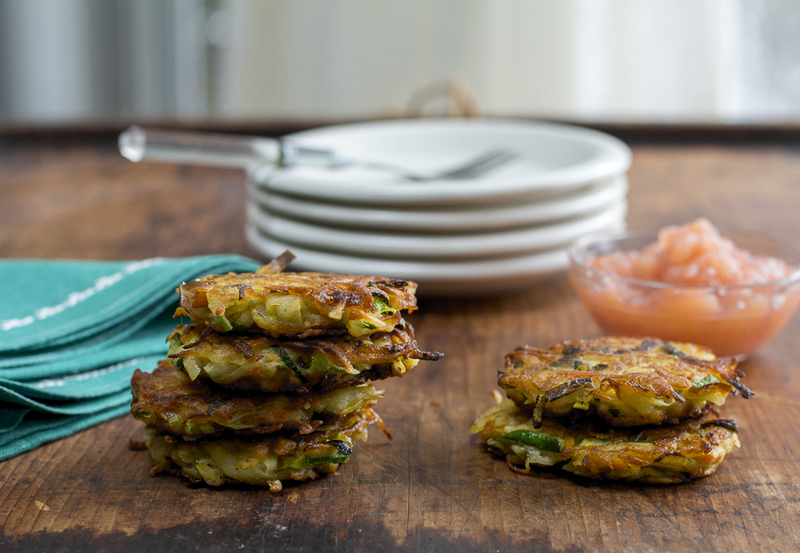 Sprinkle the latkes with sea salt and serve with applesauce, sour cream or greek yogurt on the side. This recipe may not be reproduced in any form without the written consent of its author, Karen Sheer.